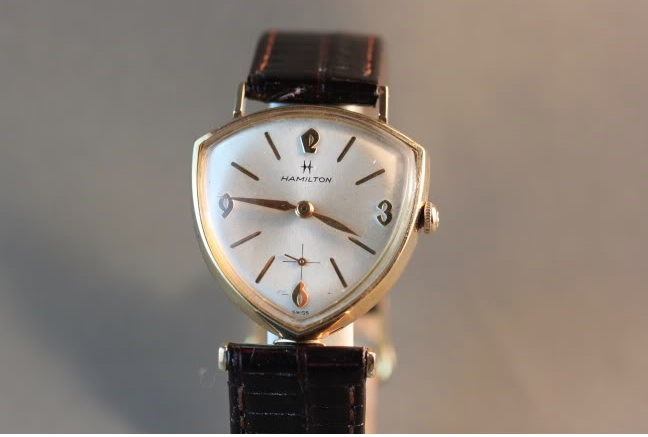 In the late 1950's and early 1960's Hamilton introduced a variety of "space age" watch designs that coincided with the United States' space program. These watches are known as "Asymmetrics" and they often got space-inspired names (but not always). Most asymmetric models also featured the electric movements like the 500, 500A or 505. 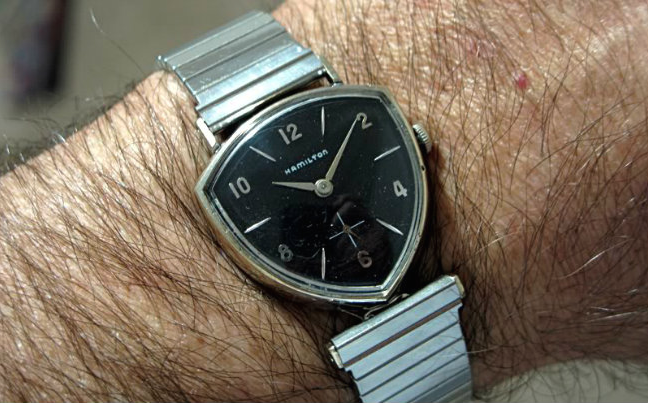 However, there are also a few asymetric models that featured mechanical or automatic movements. A good example of a mechanical asymmetric is the 1959 Thor. It was only produced for three years and was discontinued in 1961. However, a similar model, the Thor II was introduced in 1963 and produced for two years. 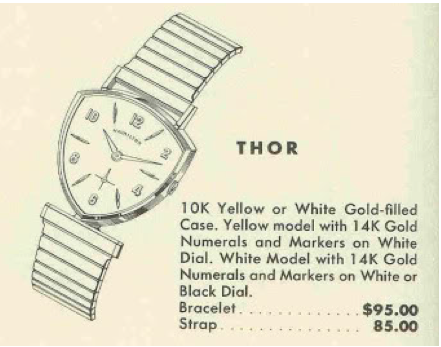 The original Thor came in a gold filled case in either white or yellow gold. It also featured the 22 jewel, 12/0 sized 770 movement. 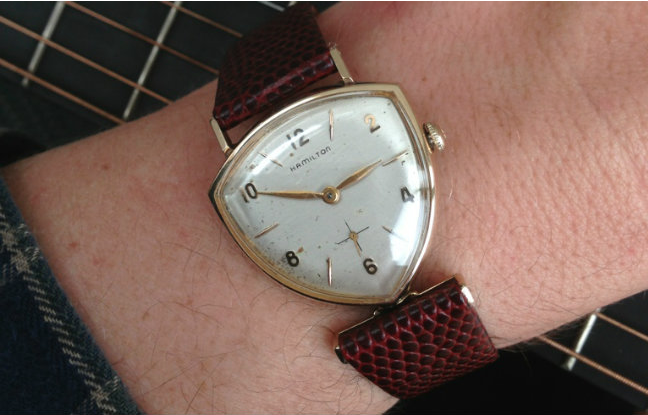 Dial options varied... yellow cased models got a butler finished white dial with solid gold numerals and markers. White cases models could get the white dial or a black finished dial with rhodium plated gold numerals and markers. The Thor II is very similar except the dial only has numerals at 12, 3, 6 and 9 (in a different font design) and under the dial is a Swiss-made movement. Here's a couple of wrist shots of Thors - the first is a yellow model on my relatively hair-free arm. The latter is a white model courtesy of the apparently much hairier, Tom Diss. A talented gold smith or jeweler might be able to fashion something for you. Otherwise you'll need a new case. Look on eBay for "sold" auctions and you'll get an idea of what they will sell for. $500 +/- $100 is a typical price, depending on condition and originality. I have a movement, dial and crystal. I'm looking for a case for it if someone might have it. Long shot, I know. That's a long shot for sure. You could keep an eye on eBay. Eventually a Thor with a crappy dial will show up and you'll be halfway there. Does anyone know where I can get a replacement band?